Khmer. The language of the kingdom of wonder – CAMBODIA. 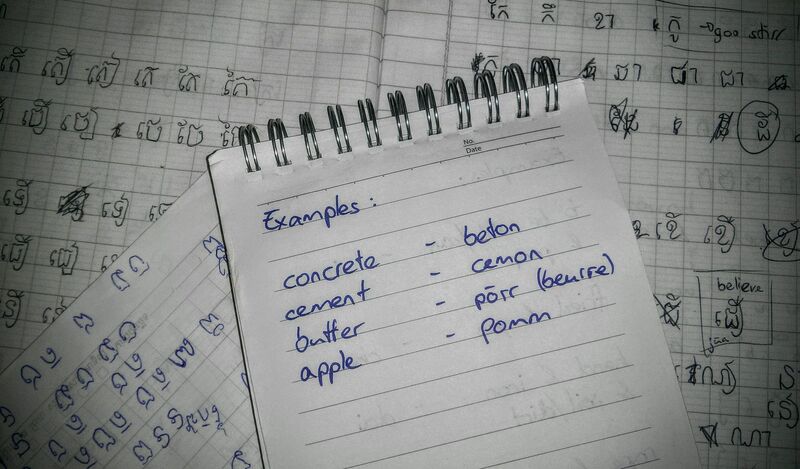 Khmer sometimes does make me wonder. But let’s begin with the facts about this rather interesting language: The Khmer language is mostly spoken in Cambodia and a tiny minority in south Vietnam as well as in Thailand at the border to Cambodia speak Khmer, too. That’s about 16 Mio. people all in all. Just as in Switzerland or other countries, they have lots of different dialects. And it’s not said, that everybody understands everybody. Finally, they use one official language with normal grammar rules for writing. There is no other language like Khmer – neither written nor spoken. At the same time, it has influenced and been influenced by Thai, Lao, Vietnamese and Chinese. All of these languages (and some more) are still being used in Cambodia by minor foreign groups. Since Cambodia was occupied by France, it also has some words in French. 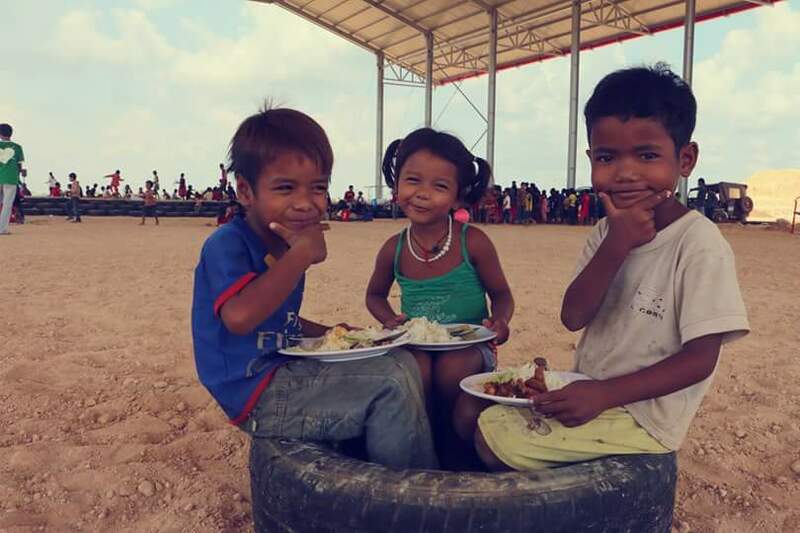 For Khmers, Christmas might be just another ordinary day. However, for us it’s a great opportunity to spread LOVE, JOY, FUN, …..
A few days ago, I got a rather special task which I first really didn’t like but turned out to be quite interesting: On Elevate Campus, we got the delivery of the sheet metal which we would use to cover the roof of our Kids Church. Since we prefer double-checking everything and everyone, I needed to organize a tool to take meassures of the thickness of the sheet metal. No really good construction shop has dared to come to Siem Reap yet, therefore, I started at the sheet metal dealer. With my Khmer friend, I tried to explain, what I need. I had no idea what to call that thing in German, let alone English and she didn’t know in Khmer either. There was not much else left than to describe using hands and feet. The kind lady behind the desk smiled at us and replied that she didn’t have it and also had no idea if that was existent in Cambodia at all. Awesome. I asked her a bit unbelieving, whether she would ever control the deliveries. She – still smiling – went, no, that’s not necessary, the deliverer would only send the right stuff. Oh, I see. From such strong trust I need a piece! From then on, I went searching by myself. Translation or not – anyways, it will not be easy. Firstly, I rode to the “Bosch”-Shop – pretty much the only one which sells good tools. Quickly, I had to detect that her English was worse than my Khmer. Stupidly, I had found it unimportant to memorize the words “thickness” and “taking meassures”. How foolish. Well. There was the other – seller or customer or angel? – who knew both languages surprisingly well. I explained him, what I was searching, he explained her and BLING! she understood. From a dusty corner she brought a tool with which you could take meassures as exact as millimeters. What a pity, that the sheet metal is thinner than 1mm. Well, let’s go then. The seller/customer/angel added incidentally that I should try in the jewellery section in Psah Leu – the local market. And disappeared. Without me having thanked him. I quickly took a photo – could be of use later – and looked again for the other guy. But I couldn’t find him. Weird. Maybe really an angel … ? Traffic in Cambodia might slightly differ from what you are used to. It can definitely take you some time to get used to it. There are loads of motorbikes, Tuk Tuk’s and bicycles and comparably only few cars on the roads. All in all, it looks like one big mess, but it works quite fine. Yesterday evening, I hit upon the bright idea to create a film of already existing material. For many hours, I was working and totally forgot about the time. Tiredness came, but motivation stayed. As I finished the first draft, I had three hours left to sleep. Over the whole film I went today again – with filled energy and concentration tanks. It’s purpose is mostly to show the beauty of Cambodia. I tried, to capture the cambodian daily life. A big challenge was to make an end. I could easily expand it to three hours, however, that would cause one or the other eye from you to be tired and my computer to crash. But who knows, there might be another creative night and another sequel …? All situations are no fake. Nothing was prepared or discussed (apart from the water buffalo which I tried to convince to walk into the water which sadly didn’t help). It’s said that silence is golden. Alright. I don’t mind power outages. Neither do I mind it if there are four a day. I knew they would happen every now and then. That’s a thing I can live with. But what I don’t like is, when I open my fridge a few hours after the power has come back and it is warmer inside the fridge than in my room! And there is the air which gets blown inside and that one is also still warm. Ah wait, hot! Sorry, but my fridge is not an oven. Alright. Keep calm. Let’s not become emotional now. Breathe in. Breathe out.